It all started with an incredible story. Over dinner one evening in January, a friend told his guests about a reoccurring adventure, one that would always start the same, but always ended in a surprise. He’d get an invitation one day which told him to dress up in his finest, be somewhere at some time, and almost nothing else about the evening. By the end of it he’d somehow be miles away from where he started, in an amazing location he’d never been to, and eating a spectacular meal with his fellow adventurers. Inspired by these stories, I told my amazing friend Trish (who is also an amazing chef) and we decided to do one ourselves. But more so on our terms… i.e. smaller scope and within a much tighter budget. Also, we’d maybe have little to no use of helicopters as a choice of transportation. Bonus #2: The Treasure "Map"
Because Trish had to return to Myanmar in a week’s time, our planning and execution time frame was very tight. It also coincided with a visit from two of my close friends from the US, so I made their attendance mandatory. I had to work on this while they were visiting which made showing them around a bit tricky. (I’m really sorry about that Courtney and Brandi.) The other friends joined because they’re really cool. While Trish was at the final location, getting the “reward” ready, (aka cooking and plating), I gathered the group to a friends’ place in Charoen Krung called Don Kuson. The building used to be a sewing factory but they did a lot of renovating and now it’s a bike shop – apartment – gallery – community space. I assigned teams and told them a story. [Once upon a time] Sometime during the mid-1800s, a Burmese-Chinese immigrant arrived in Bangkok. Gaining passage to Thailand because of her skills as a chef, she had managed to escape from a dangerous pirate that wanted her family’s rare and exquisite treasures. As the personal chef of an affluent family in Thailand, she managed keep these heirlooms safely out of the pirate’s grasp. As the years go on, she began to bring over other members of her family, doing her best to keep the knowledge of the family treasure away from the pirate. 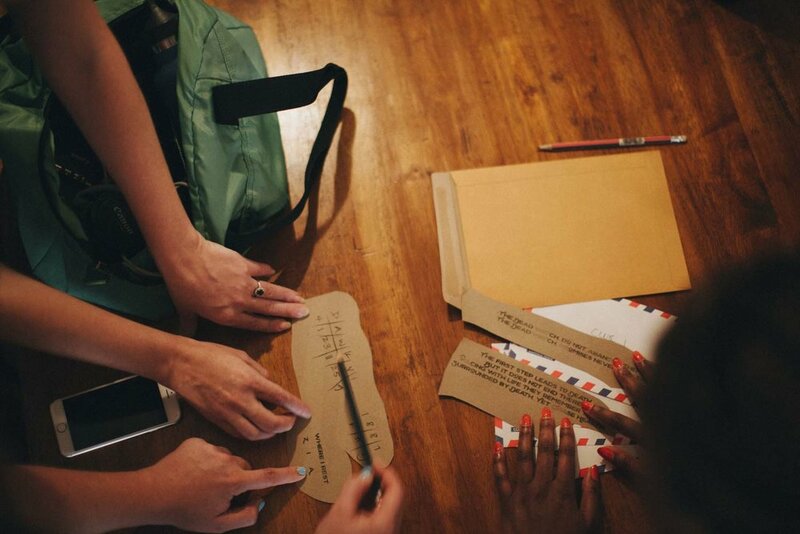 She would send letters to her youngest brother to let him know how life was going in Thailand and what she was doing to help their family. He would write in return, letting them know how the family was doing and any news about the pirate. She eventually realized what was happening when she started seeing a change in the way he would talk in his letters. It slowly started to sound like her brother was in support of the pirate’s actions. To protect the treasure, the family members in Thailand were to find a way to hide the treasure so that only a true friend of the family would be able to find it. There were enough people for 2 teams competing for the final prize, each with 3 people on each team. I would be coordinating remotely from the final location in case they needed help, hints, or just the answer. They needed to Google the answers to the clues to find out where to go next. I structured it so they could go everywhere on foot if they wanted to, and everywhere that they had to go to would be around Charoen Krung. Any answer that directed them out of the area wouldn’t be the correct one. The story and the clues all have some basis in historical fact, however loosely. The clues are all drawn from facts about each location. So not only do I get to learn about the history of around Charoen Krung, the players of the treasure hunt did too! Yay knowledge! For this first location, the teams had to work together to figure out where to go for their next clues. Afterwards they would split up until they got to the end of the hunt. Can you figure it out? Time for Answers! Group B’s clue would direct them to a specific grave in the graveyard. Using the examples of “Dawkyi” and “1887”, the letters ZIA would give you the numbers 2691. So, grave 2691. Trish and I chose this grave because of the particular vegetation around it. Once the groups sent me confirmation that they were at the correct location, I gave them the go-ahead to open the next clue. A quick (hopefully) Google search would lead to you to the Teochew Chinese Cemetery, or Pa Cha Wat Don. “Pa Cha” means “graveyard” in Thai. So the phrase means “graveyards of Wat Don/ Don Temple”. There’s another temple nearby called Wat Prok in case “Pa Cha Wat Don” didn’t get them the right location. Note: You may be wondering why they wouldn’t just open all the clues at once and skip to the end? Because 1. I structured it so that they usually needed something from the location they were in to solve the following clue. And 2. They’re not a bunch of jerks. Moving forward, the teams now had to work on their own, racing to find the treasure before the other would find it. WAITING WITH BOTH OF THESE CREATURES. SUBTRACT THE SECOND AND THE FIRST. 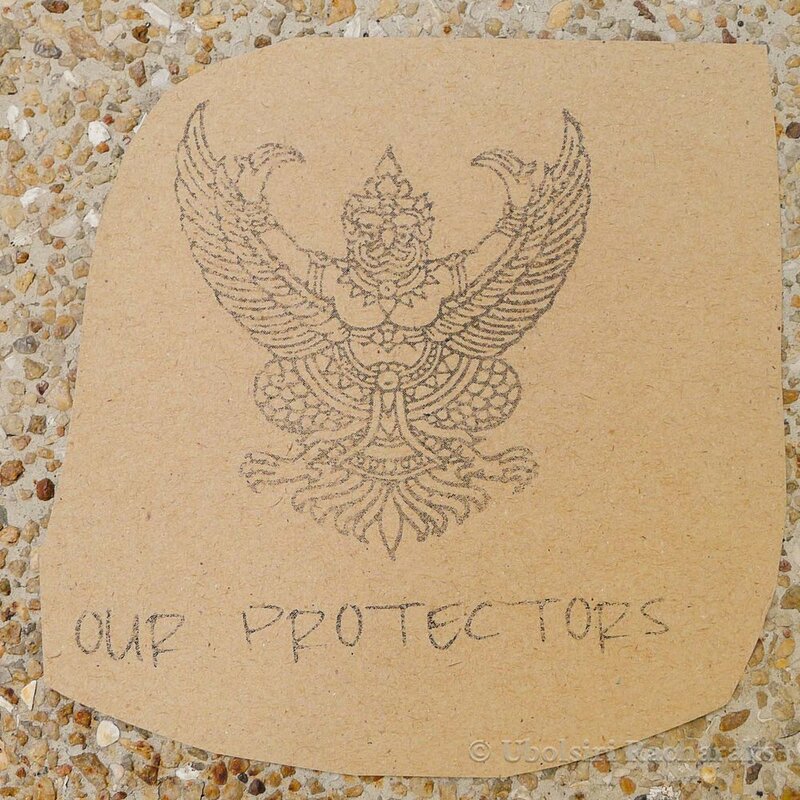 There was also a picture of a Thai mythological creature with the text “OUR PROTECTORS” underneath it. THIS UNUSUAL SHADE GROWS NEAR ME, MY FAVORITE. BROTHER "JACK" IS ONE OF OUR SECRET KEEPERS. HE HAS ASSURED ME THAT HE HAS USED HIS OWN NAME AS ONE THE KEYS TO FIND IT. Think you got it? Answer time! Group A: You had to solve the unusual shade riddle first before you could try to understand the rest of the clues. Next to the grave they were at was a very unusual green tree. (You can see it in the picture.) The color green was the answer. From there you’d take the letters of the “JMW IDFMI EDFGLC” clue and see what letters aligned with those on the newly completed alphabet line. If everything was done right, it should have given you “Low Khiok Chiang”, the Chinese name of Brother Jacobe. Some Googing would hopefully tell you that he was the one that funded the construction of Assumption Cathedral. Group B: This one wasn’t as straightforward. The clue was in two parts. The first was a math question was referring to the numbers on the grave. Following the directions, it should give you the number 2. 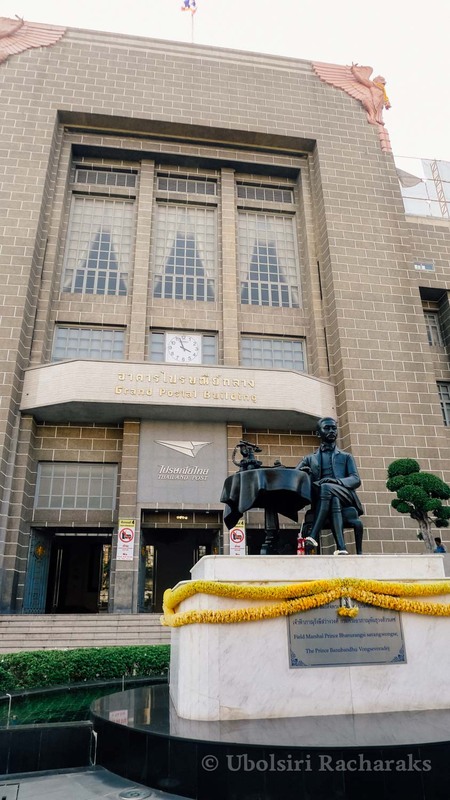 The “New Road” referenced in the clue was talking about Charoen Krung Road – it was called the New Road when it was first constructed since roads didn't get official names yet. The other part of the clue required you to combine the text about the field marshal and the image of the Thai mythological creatures. The creatures are called Garuda and there are two of them, each on the top corners of the Grand Post Office Building. (Click on the picture to see them at the top. They're pink.) 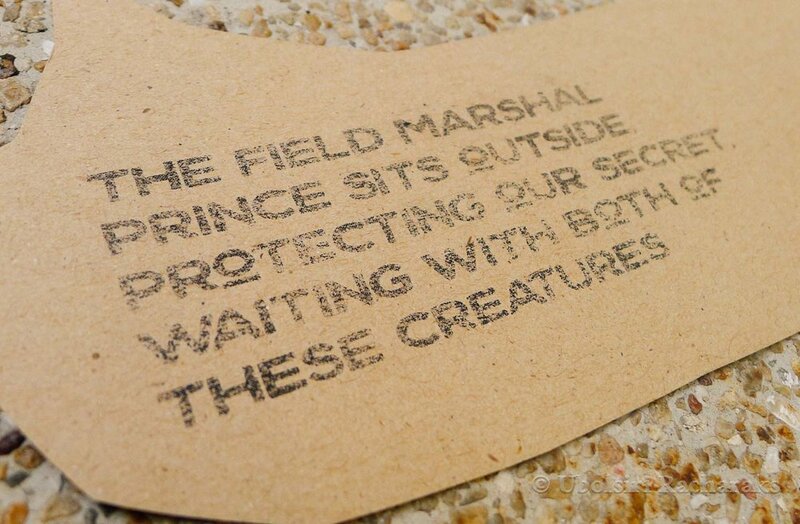 A statue of the Field Marshal Prince sits outside and the address? Group B was having some trouble figuring out the answers to clue 2. I had to give some hints, and they ended up figuring it out, but they fell behind Group A. Group A solved their riddles fairly quickly, but ran into the then Prince of Thailand (now King of Thailand) and the Emperor of Japan at the cathedral. They tried to make friends and explain that they were on a very important treasure hunt, but it didn’t work. I ended up having to have to give them one of the answers. OF WHAT I ONCE WAS BEFORE. NOW I AM ONLY A FACADE. AND NOW I AM JUST A LINGERING MEMORY OF TIMES PAST. Are you even trying to answer these? The second clue referred to where the old fire brigade was – the Old Customs House. It becomes: Rong Phasi. The phrase referred to the tax that the Old Customs House used to place on foreign ships. It became the nickname of the office during that time. The second riddle referred to the architectural style of the building and the fact that the Customs Office was moved to Khlong Toei. So yes, both the groups had to meet up again for the final clue. They also had to work together again to get to the final location and the treasure. So who wins? Everyone! I had cut out the clues in a way so that they were jagged and kind of old looking. But I had an alternative purpose in cutting them this way – so that the teams wouldn’t [immediately] realize that there was something on the backs of the clues as well! Haha! I’m a puzzle genius! Ah, I’m not. I bet they all noticed that there was something on the back pretty quickly. THIS IS WHERE YOU'LL FIND THE REWAR. THE REVERSE WILL GET YOU THERE QUICK. THE FOOT OF THE GHOST IS WHERE I SIT. OVER THE RIVER IS MY SPIRIT. So the rhyme basically said that the final location is at the foot of the “Ghost Tower”, the colloquial nickname for Sathorn Unique Tower, an unfinished skyscraper that people have been sneaking into for years. “The reverse” referred to the image I printed on the back of the clues. If you arrange all the clues together, it creates the logo and the word สะพาน, which is the Thai word for “Bridge”, an art gallery that’s located at the base of the Ghost Tower. So I alerted Trish and Dan, the owner of Bridge, that the teams had solved the final puzzle and were on their way. I managed to find some chocolate coins that were encased in a treasure chest, so that was their "reward". The real reward? 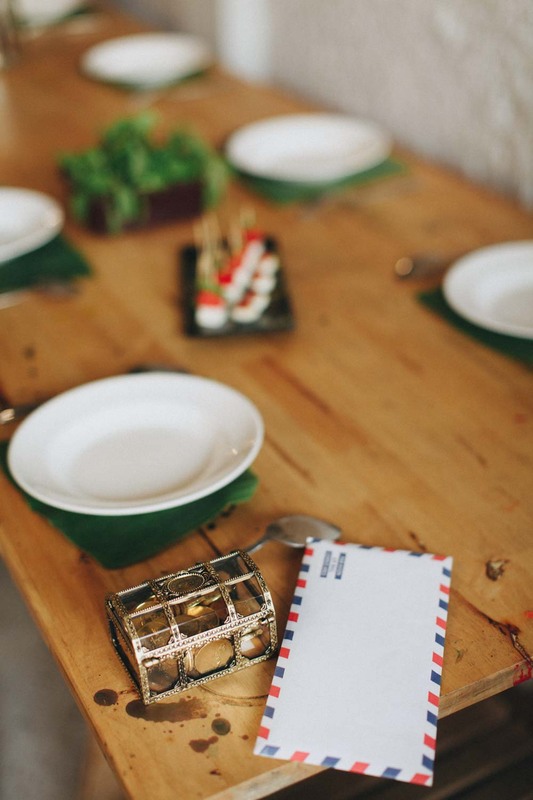 A dinner menu specially created and cooked by Trish just for this event! She created this menu based on our budget and the story I told the teams at the beginning. It was delicious and a great end to a fun evening (I'm assuming). This evening wouldn't have been made without the help of some amazingly talented wonderful people and friends. First, the Chef, Queen of the Cuisine, Maker of Dining Delights, Breaker of Diets, and the First of Her Name (ok, that last one probably isn't true): Trish! My co-conspirator in all this, she got this whole thing into gear when the pressure was on. See what she's making now (as well as other photos from the evening) on her page, The Pickled Leaf! Finding the perfect location to start the whole hunt was a tricky task. But our friends Alex and Abigail and their fantastic community creation, Don Kuson, provided the perfect space to get the puzzles going (and some drinks flowing). Learn more about what they're doing with their bike shop on the ground floor by visiting their page, Don Kuson Community Bike Shop! Then finding the final location was another challenge altogether. It had to be optimally located in our hunt radius, slightly inconspicuous (so the teams couldn't guess it immediately), and still very welcoming to two women who had a crazy idea for a treasure hunt. Major and many thanks to Dan at Bridge! He heard our plans, didn't think they were silly, and even wants to do more treasure hunts in the future! See what new exhibitions and shows they have going now at their page, bridge! And of course, all the photos from the event day (and probably the ones that you liked the most in this post) wouldn't be possible without the sharp eye of Megan Rogers. See more of her beautiful work at her website, the Elsewhere Collective! Trish and I had been scheming and slowly pulling together a plan for the past month or so, since I had brought it up in early January. We figured this would be a thing just for friends and not for profit. Just for fun! Depending on how it would be received, we’d maybe consider doing more in the future for more money focused goals. Why Charoen Krung? Both of us didn’t know much about the area and we knew the majority of our friends didn’t either. So our new knowledge gets to be their hiding spots for clues! Hooray! If you're curious where all the locations are and/or about the routes of the teams, the map below will show you! You may have to open it directly in Google Maps to be able to mess with all the layers.